Contrary to appearances, invasion film "Battle: Los Angeles" is not science fiction. Yes, there are aliens, but the movie is as much about extraterrestrial life as "Taxi Driver" is about public transportation. They're a means to an end and nothing more. The "Battle: Los Angeles" aliens are hardly seen, and when they are, they appear to be some sort of biomechanical hybrid — fairly interesting territory explored plenty of times in works from "Blade Runner" to "Battlestar Galactica," but pretty much glossed over here other than a scene in which soldiers figure out where to aim their fire. No attempt is made to give any insight into the invading alien forces, including where they came from, and the only motivation disclosed (something about consuming Earth's resources) is presented in the form of stray guesses from talking heads on TV. Aliens and humans are battling and it is indeed happening in Los Angeles, but there's no real indication as to why. Yet in the post-"District 9" world, there is something unsatisfying about being presented with a group of antagonists so deliberately unambiguous. None of that makes "Battle: Los Angeles" a bad movie. It's clear that, despite the marketing campaign's efforts to tie the film to the 1942 air raid scare known as "the Battle of Los Angeles" — which some believe to be evidence of contact with UFOs — the movie is never about the aliens. It's a war movie, with an apolitical enemy that the audience doesn't have to feel guilty about as they're being blown away by members of the U.S. military. On that level, it works to an extent. The easy comparison is to first-person shooter video games like "Call of Duty"; the main characters all fit that pixelated mold, starting with Aaron Eckhart's Marine Staff Sgt. Michael Nantz. Nantz is a tough yet compassionate veteran harboring a terrible secret, one he carries with him nearly all the way to the third act. Eckhart's acting has drawn acclaim in films as diverse as "The Dark Knight," "Rabbit Hole" and "Thank You For Smoking," but here he doesn't have much to do other than rattle off rah-rah clichés along the lines of, "We make our stand here"(though he does a more-than-able job of that). There's also a group of civilians along for the ride — it's a worldwide invasion, but the entirety of the movie focuses on a small group in the city, led by Michael Peña and a barely noticeable Bridget Moynahan, who aren't called upon to do much more than react. 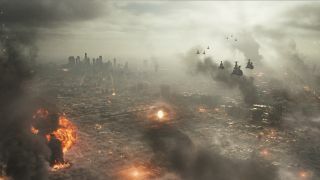 "Battle: Los Angeles" is definitely the highest-profile film of Jonathan Liebesman's directing career — past credits include horror films "Darkness Falls" and "The Texas Chainsaw Massacre: The Beginning" — and for roughly two hours of reasonably likeable good guys versus faceless bad guys, it's entertaining enough. But if the idea is to show all of the "cool" explosions and gunfights associated with war while staunchly avoiding all of the consequences and moral complexities that come with real life — well, why not just play a video game? Albert Ching is a staff writer for Newsarama.com,a sister site of SPACE.com.